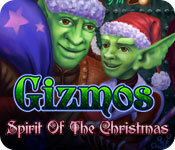 Gizmos: Spirit Of The Christmas is rated 4.2 out of 5 by 17. Rated 5 out of 5 by pennmom36 from I Believe In Gizmo! Another fantastic nonogram puzzle, Gizmo Christmas style. A nonogram consists of cells that can be filled in or left blank. 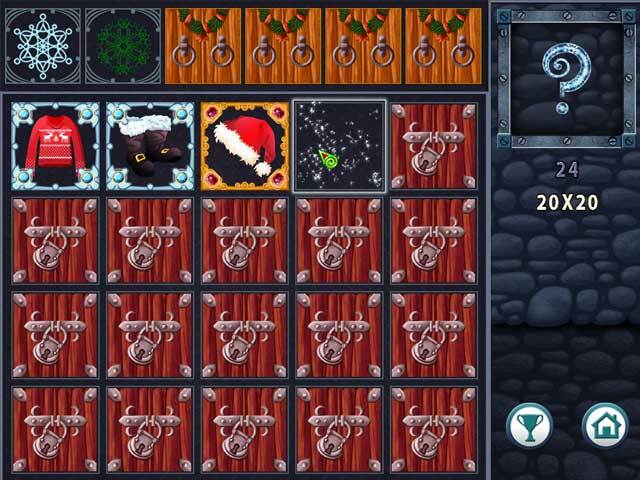 To solve the puzzles you need to unlock all the filled in cells. The numbers along the sides of the grid indicate the number of filled in cells in the rows and columns. With every correctly filled cell, the hint vessels will fill up with energy for you to use, however, all of these puzzles can be solved without using the hint vessels (yeah right!) Your score will be based upon comparison of your time vs. the perfect time, and whether or not you used the hint vessel, had misclicks and actually solved the puzzle. There are achievements to earn as well, with 6 different categories and 5 games within each category. If you click on the settings options, you can choose to auto fill in blanks, disable backgrounds images, disable voices, and even disable the helpful hints, enjoy! Rated 5 out of 5 by nufsober from ABSOULUTLY TOP NOTCH!! ANOTHER WINNER!!!!!!! I've got the last gizmos game and have yet to finish it! This one seems to be harder, yet, with luck, I should be able to be done with both soon. Then I can start again and maybe get higher scores! Great for all who want to relax and have fun filling in squares of color, or want a challenge as well!! I bought this one early into the free play! Rated 5 out of 5 by riefer from Gizmo games excellent as always If you love nonogram games, the Gizmo series is the best-implemented one I've ever come across. No guessing, ever. Every puzzle is completely solved with logic. The way that it autofills when you're done the row is great. It never makes assumptions - some games, when you have 1 4 4 1, will grey out one of the 4's once you have a row of four finished on the board. That's a clue, which I don't want, as to which of the 4's you've gotten. This one will leave it un-greyed until either the 1 beside it or the other 4 is solved. It's just fantastic, better than Fantasy Mosaics, better than any of the others. I've seen some reviews on other Gizmo games that said you had to guess sometimes, but that's not true. I finished both of the other games with no guessing at all. They are all solvable by logic only. The storyline is pretty bad, and so are the graphics to illustrate the storyline. But I don't care. So is Fantasy Mosaics, and people still love that game. Also I don't know why they throw in the jigsaw puzzles, but whatever. There's maybe a dozen or so of them. I just finish them so I can get the achievement; I think they're skippable. All in all, my favourite nonogram game. The only one I've come across that I think is better is web-based. I don't think I can put the name of the site here though. Rated 5 out of 5 by kim0530 from Another great adventure with the Gizmos If you have all the series, there's not much for me to say on how well thought out the developers did with the nonogram game. But if this is the first, then you will have a treat. First, you will need coffee or tea for this game. You WILL need to put on your logic cap because there's no guess work.. IF you are an expert on nonogram then you will understand that the developers started out with 10 X 10 grids not 5 X 5 but will go higher as you progress. I'm not an expert on this type of game because I could finished the puzzle but not within the time. But that's fine by me. I also love the sound effects but mostly on how they can flow from Halloween to Christmas. Who knows. Maybe the Gizmos will have a New Year adventure. Rated 5 out of 5 by sunnyglow from HAPPY YULETIDE FROM GIZMOLAND What a nice Christmas present. A big THANK YOU for the Christmas themed Nonograms. Hiding the Christmas presents, I almost missed this one, sneaky BF. I absolutely love these! Call them what you wish, but the Nonograms, aka Pic-a-Pix, aka E'Kaki, aka Paint by Numbers, are some of my favorite puzzle games. This is a variation of Sudoku. This one is one the better devs in providing this type of game. It is all wrapped for Christmas. This dev throws in some jigsaw puzzles as well. You are timed in this game. However, I think the time is a little fast and I have been playing these for years! There is autofill. You receive achievements throughout the game. However, the best thing about this particular dev is that you can SAVE AND EXIT, which some of the devs do not provide. It it does not provide color and the pictures are fairly nondescript. 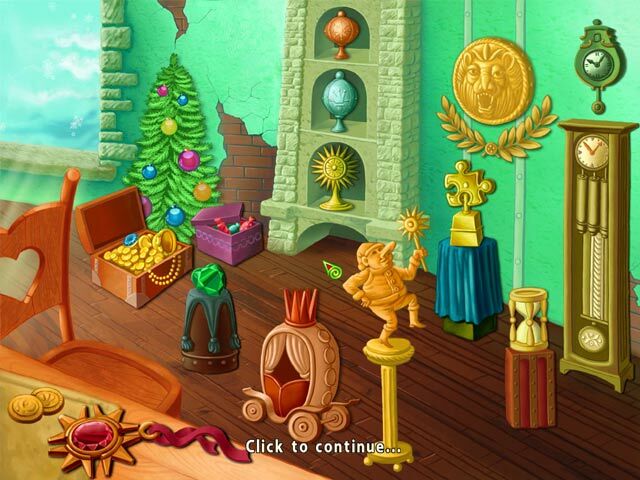 However, the characters in the game get you into the festive mood. Rated 5 out of 5 by phatkhat from Another winner for the green guys! Bought this on release day at another site which beats BFG to them by a week or so. Like its predecessors, it is a fantastic nonogram game! There is no guessing here - all can be deduced through logic. Nothing worse in nonograms than ambiguities! And they get hard very, very fast! These are quite challenging - even for a nonogram addict like me! Gizmos, unlike Fantasy Mosaics, have an actual storyline, though not as compelling as World Mosaics. They are humorous, like Gem Sweeper. And they have some very good options, like turning off the background. This is a welcome option for me. I love Arizona Rose, but hate the way the background intrudes on - and confuses - the puzzle itself. You can also turn off the voices but keep the music. You can also replay the videos. If you love nonograms, then you gotta have Gizmos! Rated 5 out of 5 by sabinesa from My life is saved! Just last night needing a bit of time to relax I checked out my not-finished games and I wasn't too excited. With a big sigh I thought: "Wouldn't it be just great to have another Gizmos!" And Santa heard my plea, here it is! The gizmos series offers by far the best nonogram games around. What makes them so special are the optional settings, like the auto-fill, which is absolutely brilliant and one of my favourite features. Because I never use a game cursor, as I find that distracting, I like the option to turn that off also. But note: widescreen needs to be turned off (interestingly that makes the board bigger and the cells square, otherwise they look oblong - at least on my setup), otherwise the system cursor doesn't hit the mark properly. Another nice one is the "turn background off". Its a bit unfortunate, but for a nonogram, specifically in the higher levels non-negoatiable. To achieve gold one has to finish inside a specific time frame as well as have had no misclicks. This type of scoring system is so nice, it gives a challenge and something to work towards, without messing up the fun and enjoyment. Some of the other nonogram games, like Magic Gridlers and the many alike ones from the same developer don't allow you to advance if you didn't meet certain criteria - well, that's a sure fun killer in my book. The little story line is sweet as with the other two games in the series. It's not overwhelming and doesn't take 5 hours reading first, comes with cute little drawn characters and fits the theme. The music of the first was the best and I didn't get tired of it. The second one already got on my nerves a bit after a while and I'll see how I fare with the Christmas jingle this time. Alas, as the music can be dimmed or altogether turned off, that's not a problem. I noticed with the 2 other Gizmos that reviewers were complaining about things that were under their control, but they didn't realize it. I can only encourage you to try this out and if there's something you don't like, check out options and try various settings. I am almost certain you'll find a way to make this work for you nicely. Sorry, got to go, got a game to play! Rated 5 out of 5 by Andovape from True Nonogram This is the third in the Gizmo series and is much play is much like the first two. I have played through the first two Gizmo games twice each as I adore nonograms - especially when there is NO GUESSING! I really hate to finish a puzzle just to find you have to guess on the last two moves. Another reviewer outlined the game so I will just comment on play from my perspective. I like the challenge of completing a puzzle without using a hint or making any mistakes. I take my time the first round and usually don't make the perfect time, but that lets me go back and play it again. With practice, you get quicker at solving the same board. 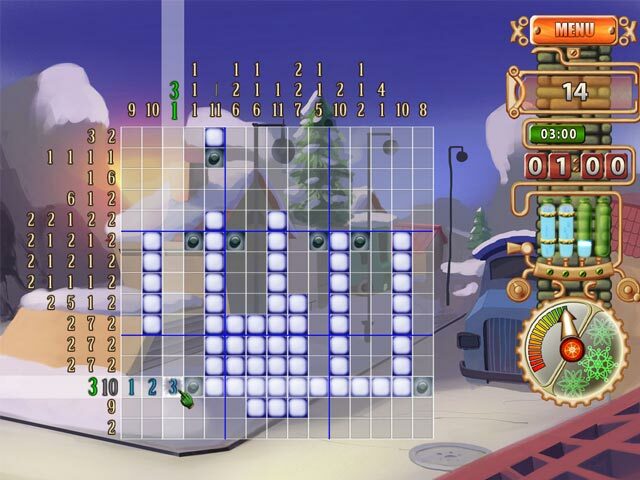 Gizmo puzzles start out fairly easy with 10 x 10 boards, but the board size increases quickly. The last two games ended with 30 x 30 boards. I turn off the background music after a while and listen to my own music. I also turn off the background images as it is much easier to play with a black background. Because of the "no guessing" play provided by this developer, this was an instant buy for me and I highly recommend the Gizmo series if you enjoy nonograms. Rated 5 out of 5 by margot01 from The best nonogram game In my opinion are the Gizmo games the best nonogram games on the market. The challenge level, the autofill option, the jigsaws; everything is good about this games. I bought all three of them. Come celebrate Christmas with these holiday themed puzzles and help the residents of Gizmoland bring on the Christmas cheer!